Now what's that got to do with our store for this week? Absolutely nothing. Well, actually a bit of something. I mean take a laundry shop. You bring your clothes in, put them inside the washing machine, sit around while your clothes are being washed, take them out and go home. Utter boredom, I say. Then take a restaurant - let's say a restaurant that offers cinammon rolls. You go in, order your meal, sit around, finish your food, and get out. Utter boredom again. But then, combine these two together - laundry shop and cinammon roll restaurant, and what do you get? 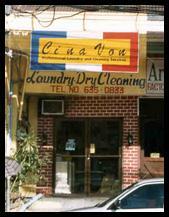 A laundry-cinammon shop! Amazing idea, huh? Yes folks - Utter boredom + Utter boredom = Non-boredom! Fantastic! You come in, put your laundry in the machine, order a meal, sit around, finish your meal, pick up your laundry and go home! Waittaminute...that doesn't sound too exciting too. Hmmm...maybe it's not such a good idea. But well, hey life's not perfect. Just check out the store, will you!